When LEGO first designed a set for The Last Jedi’s badass Resistance Bomber, they only had some art and reference photos to go on. So they gave the pilot a placeholder name and white skin and released it. Once the film and its expanded canon hit, though, it turns out the bomber’s pilot had a name, and he was black. Obviously the skin colour and face have now changed, but so too has the pilot’s helmet design. That’s because ever since The Last Jedi’s release, and the release of a canonical novel about the Resistance’s bomber crews, the pilot has gone from being what LEGO assumed was filler to an actual character in the Star Wars universe. His name is Finch Dallow, and you might remember him as the pilot of the last remaining Resistance bomber, the one also crewed by Rose’s sister Paige, which manages to release its bombs and destroy the First Order Dreadnaught. 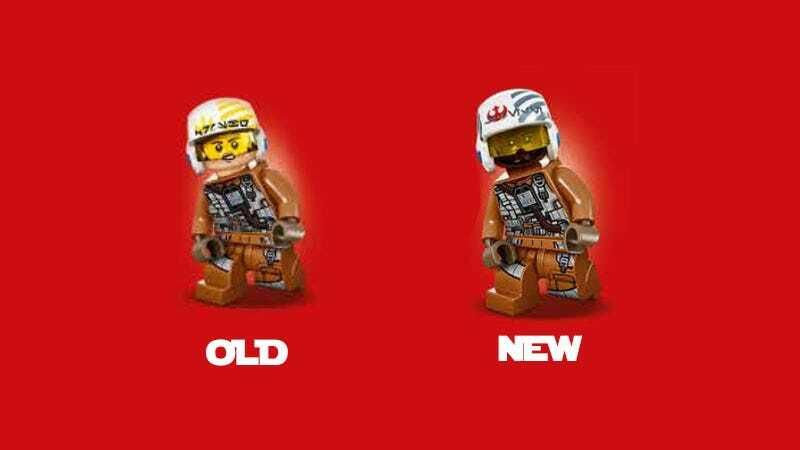 The decision to replace the figure wasn’t down to a mistake on LEGO’s part; as a representative from the company told a fan who contacted them about the change, it was just down to the limitations of trying to make toys based on a movie before that movie is actually released. He’s not the only one excited; because the original set is already off the shelf in some regions, and it’s difficult to specifically request the updated version when ordering online, the Finch replacement figure is already going for a lot of money on eBay.